Spanish shipyard BD Yachts presents the BD56, an exclusive project that gathers in a single luxurious, original and refined “seagoing SUV” all the advantages of sail and motor boating. Dedicated to the new generation of expert and demanding owners who have no use for stereotypes. BD Yachts – with their years of experience building luxury mega-yachts and high performance racers, acquiring in-depth knowledge of what owners really desire, BD Yachts is proud to present the BD56, a custom made yacht that supplants the concepts of sail and power, inaugurating a new way of going to sea, free of restrictions and labels. Winner of the 2009 MYDA (Millenium Yacht Design Award), the 16.66 by 4.5 meter yacht's decisive charisma and styling emphasize her hybrid capacities, with an entirely glass enclosed superstructure that blends in perfectly with her streamlined high performance sportive styling. But it is the concentrate of detailing and technology that make her a small sized, super luxurious yacht, tailor made to her owner's needs. 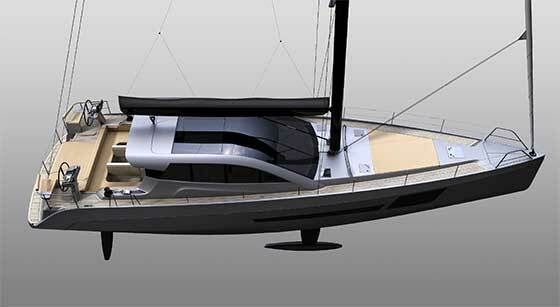 Built with state-of-the-art technologies and materials – successfully developed for the Volvo Ocean Race and the America's Cup – the BD56 project was created to satisfy passionate demanding owners who are searching for a different way of going to sea, to continue to enjoy the emotions that sailing gives, but without sacrificing the comfort, luxury and speed of power boating. 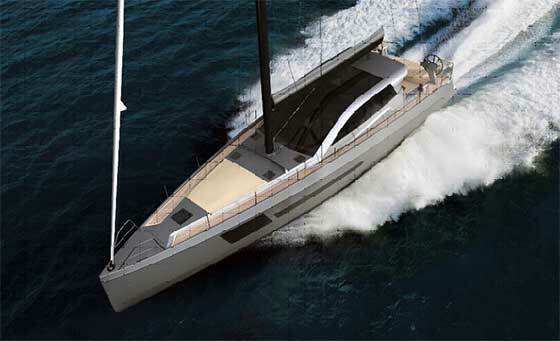 Vacuum built in vinylester resin, the BD56 features a retractable keel (from a 3.5 meter to a 2.1 meter draft), carbon fiber mast, roller furling mainsail and self tacking jib. Thanks to her sail plan and hull shape, optimized by the latest software solutions, the BD56 is capable of excellent speed under sail, enough to satisfy the most demanding racers. 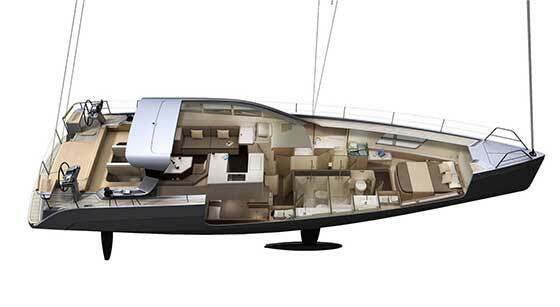 The deck layout is clean and ergonomic, with twin wheels bringing all controls to hand, easing crew work and guaranteeing safety for all her guests. If the wind doesn't show or if a storm does, and it's time to rapidly get back to harbor, the BD56 quickly transforms into a fast motor yacht. With a safe and comfortable top speed of 21 knots, the two outboard motors not only increase performance at sea, but they also increase available interior volume and allow further options for interior layouts to satisfy the needs of her owner. The BD56 is very easy to sail, yet this simplicity comes with no sacrifice in performance. Even less experienced sailors may sail her without difficulty. The in-boom roller reefing mainsail allows for easy reefing and lowering of the powerful mainsail, as does the roller furling for the self-tacking jib. With her electric winches and retractable motors, sailing a BD56 is no more difficult than playing with a toy. These unique features enable the BD56 to fly over the water even in the lightest breeze. When sailing downwind, the gennaker will quickly bring the BD56 onto a stable plane, providing fresh emotions even to experienced sailors. The twin outboard engines, controlled by means of a multifunction joystick, guarantee excellent maneuverability, even for those with limited experience. Designed and produced in compliance to European Community standards, the BD56 has been certified by HPI, a leading British yacht certification company. Their strict protocols for fuel use and storage with outboard motors maximize safety even in the most extreme weather conditions. The bright and scenic salon, at the same level as the cockpit, is the heart of the BD56. Thanks to electrically commanded overheads, doors and crystal walls, from the salon you can enjoy your view of the sea in any weather, with a 360° panorama. The layout, designed around the concepts of light, comfort and contact with the open air, foresees three twin berth cabins, each with its own bathroom - and two with separate showers. All the cabins are spacious and filled with light, with excellent headroom. The master cabin is forward and has a breathtaking view thanks to windows that stretch down to the waterline. But it is always the client who has the final say in choosing their favorite layout, with finishings and materials (including the engines) to give them a unique vessel that reflects 100% of their personality. Jordi Bisbe, CEO of BD Yachts, comments: “The change in owner's habits – their love of the sea and everything that's connected to it, the silence, independence, the pleasure of fishing, but at the same time the lack of free time, typical of today's society – has brought us to develop a new concept in a sailing yacht that, thanks to modern technology, lets everyone live their passions to the full. For those who can't take month long vacations, the BD56 is the ideal yacht." Environmentally friendly, easy to handle even while shorthanded, spacious, comfortable and with excellent seakeeping qualities, the design from BYD Group satisfies everyone without compromising on versatility, customization, service to the client (after-sales service includes a five year guarantee), high quality materials and technology: the BD56 is on the move to conquer the market and launch a new trend.